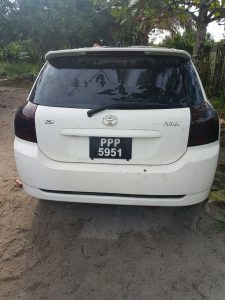 Several cars and numerous vehicle parts have been seized as Guyanese police widen their net to crackdown on a massive trade in stolen vehicles and parts. 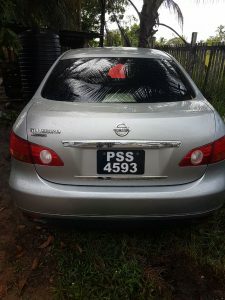 Police said they Friday night swooped down on a property located at Monument Hill, Kuru Kururu, Soesdyke/Linden Highway and conducted a search during which a quantity of vehicle parts and several vehicles suspected to have been stolen or unlawfully obtained were found and have since been lodged at the Timehri Police Station. Five persons, including an ex-policeman, and four females have been taken into custody and are assisting with the investigation. 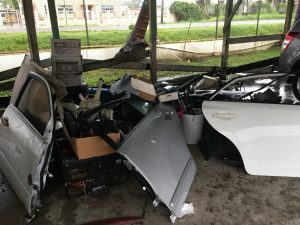 Meanwhile, on Saturday police arrested a man and his wife in connection with the discovery of a number of car parts believed to have been linked to stolen vehicles at the couple’s residence. 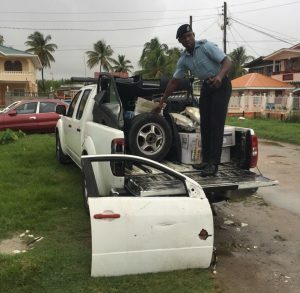 Head of the Criminal Investigations Department, Assistant Police Commissioner Paul Williams said persons, whose vehicles have been stolen, can go to the CID Headquarters, Eve Leary from Monday at 9 AM to see if any of the parts is their property. 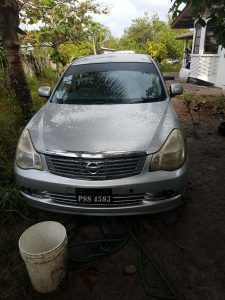 He told Demerara Waves Online News that a quantity of parts for Allion, Premio and Spacio cars was found at the house located at 96 Vryheid’s Lust, East Coast Demerara. Detained for questioning are 29-year old Shivendra “Buju/Mohan” Tekumarie and his wife, 29-year old Davina Arjune. Arjune reportedly told investigators that he usually buys car parts for a bodywork technician, but the technician said he has no connection to the man. 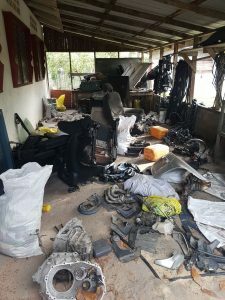 A quantity of car parts seized by police. Investigators believed the parts are linked to dismantled vehicles that had been stolen. While there has been a lull in the number of carjackings compared to late last year, police are still searching for the thieves and their accomplices. 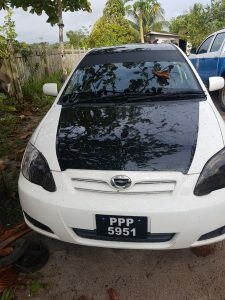 So far, several persons have been arrested and charged for being in possession of stolen vehicles and parts or actually stealing persons’ vehicles.